Over the past 25 years, SMI has developed multiple investing strategies, each with its own strengths, weaknesses, and attractive historic track record. An investor can use any of them independently, of course, but combining them in specific ways may pay great dividends. Here, we explain how to design portfolios built for maximum return while still greatly minimizing risk. One of Sound Mind Investing's strengths through the years has been developing strategies that have produced excellent returns, while simultaneously being relatively easy to understand and implement. For simplicity, most readers tend to implement only one strategy and ignore the others. That's fine. But have you ever considered combining various SMI strategies? At first, that may seem too confusing. Each strategy may make sense individually, but wouldn't combining them muddy the potential impact on a portfolio's overall risk and return? And, of course, many practical "how do I actually do this" questions come up. We thought it would be helpful to take a look at three of SMI's most popular strategies and walk through exactly what happens when they are combined within a single portfolio. We know from reader surveys and other interaction that Upgrading is by far SMI's most widely-used basic strategy, while Dynamic Asset Allocation (DAA) and Sector Rotation (SR) are the most widely-used of our premium strategies. We think most readers will find what follows to be an intriguing look at the risk and return possibilities presented by various combinations of these strategies. But for newer readers, please understand there's no need to complicate things with these premium strategies if you're still in the process of getting comfortable with the basics. Feel free to put this issue aside for six months until you've mastered Upgrading. Then perhaps come back to this discussion and see how adding SMI's premium strategies might enhance your overall portfolio. As most readers know, Upgrading is SMI's foundation. Upgrading's core idea is that superior performance is available by standing ready to replace lagging funds with the current top performers within fund risk categories (or peer groups). This reliance on recent performance — or "momentum" — is a foundational principle on which several of SMI's other strategies are built as well. While momentum drives the "return" side of the Upgrading equation, we rely on conventional asset allocation to handle the "risk" side. Conventional asset allocation simply refers to the process by which an investor decides how much of a portfolio to invest in particular types of assets. This decision is made by first understanding one's season of life (how soon the money will be needed), then aligning that with one's risk tolerance (how much volatility one feels comfortable with). Typically, conventional asset allocation controls risk by steering investors away from more volatile stock investments as they age and adding more stable bond investments instead. For Upgrading's purposes, the first step of this asset allocation process concerns how much to invest in stock funds vs. bond funds. A second layer of diversification is then presented as the stock portion is further divided into as many as five stock-risk categories, and the bond portion is divided into three bond-risk categories. (Upgrading: Easy as 1-2-3 offers an overview of this process.) This is a practical fleshing out of the "don't put all your eggs in one basket" nature of diversification. The analysis below begins with simply plotting various stock/bond combinations of our traditional Upgrading portfolio. Here's how to read all the charts that follow. The vertical axis shows how much better than the market's return each strategy combination performed. The zero horizontal line at the bottom of each chart represents the stock market's return, as measured by the Wilshire 5000 index (the broadest U.S. stock market index). If an investment strategy earned exactly the same return as the market, it would appear as a dot right on this zero line. A return lower than the market's return would be below the zero line. (This never happens in the analysis that follows; if it had, we would need a second set of two boxes on the chart beneath the zero line showing returns lower than the market's return.) For our purposes, we want to see strategy results that are as high as possible above the zero line, meaning that results were better than the market's rate of return. In addition to measuring returns, these charts also measure risk, relative to the market's overall risk level. This is the horizontal axis, with the market's risk level in the center (the dividing line between the gray and white boxes). Here, we prefer to see results as far to the left as possible, indicating that a certain strategy combination's volatility was lower than the market's. Any points in the white section of the chart to the right of the zero dividing line indicate a strategy combination that was more volatile (risky) than the market as a whole. Chart 1 shows the practical implications of conventional asset allocation on Upgrading portfolios. Point #1 shows the risk/reward performance of a 100% stock Upgrading portfolio over the past 15 years (1999-2013). The chart and table beneath it show that on average, 100% stock Upgrading earned 4.5% more than the market, with 7% more volatility. Points #2, #3, and #4 show how the addition of bonds to an Upgrading portfolio significantly reduced volatility, but also lowered returns. (The portfolios in this article reflect the performance of Upgrading's historical stock recomendations and allocations, but use SMI's current bond funds and allocations rather than those used prior to 2014. this was done to present a more likely picture of what to expect going forward.) For example, point #2 shows the risk/return of an Upgrading portfolio that is invested 80% in stocks and 20% in bonds. That mix had an annual return of 9.3%, which was 0.6% less per year than the 100% stock Upgrading portfolio. But the 80%/20% portfolio achieved that return with 13% less volatility than the market. A 100% stock Upgrading portfolio earned higher returns than an 80%/20% portfolio, but at a "cost" of being roughly 20% more volatile. Points #3 and #4 offer further reductions in volatility as bonds are added and stocks reduced, but at the expense of lower returns. For many SMI readers, Chart 1 summarizes the totality of their investing experience. Their biggest investment decision is deciding how much to allocate to stocks vs. bonds. But for those willing to entertain SMI's advanced strategies, there's more to the story. DAA "wins by not losing" — meaning that what DAA isn't invested in is just as important as what it is invested in. The timing mechanism built into DAA would have allowed the strategy to sidestep many of the stock market's losses in recent decades. By riding established trends in various asset classes, DAA has been able to capture a healthy portion of the upside when classes perform well, while avoiding much of the downside when they fall. DAA won't perform as well as Upgrading when stocks rise, because it is never fully invested in stocks. But it can hold up much better than Upgrading when stocks fall, because it can quickly exit its stock allocation completely. Upgrading's strength is seen best in rising stock markets while its limitations are seen when stocks are falling. Because of these opposite strengths and weaknesses, SMI has recommended that readers consider splitting their portfolios 50-50 between the two strategies. 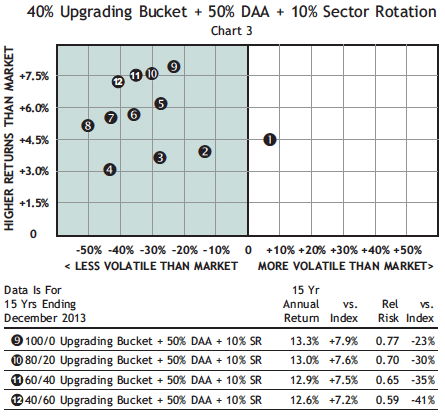 Chart 2 shows what happens to the risk and return of a portfolio when it is divided 50-50 between Upgrading and DAA. Practically speaking, all we've done is take the earlier Upgrading portfolios, divided them in half, kept one half in Upgrading as it was, and invested the other half in DAA. The first four points from our first chart remain for reference, but the focus now is on portfolios 5-8. We suggest first looking at these points in pairs: Portfolio #1 was 100% stock Upgrading, whereas Portfolio #5 now takes half of that portfolio and invests it in DAA. Two things are immediately evident: the return of Portfolio #5 rose markedly (from 9.9% annually for Portfolio #1 to 11.6% annually), but its volatility fell at the same time (from 7% more volatile than the market to 27% less volatile). This is an amazing combination! Any time we are moving up and to the left on these charts, it is a very good thing, as that indicates better returns with less risk. Our 80%/20% portfolios (points #2 and #6) show the same thing, as do the 60%/40% (#3 and #7), and 40%/60% (#4 and #8) portfolios. It's important not to miss the implications of this. Notice how Portfolio #5 and Portfolio #3 have nearly identical risk profiles (27%-28% less volatile than the market). Portfolio #3 required a 40% allocation to bonds year-round to achieve that relative lack of volatility. Yet Portfolio #5 is able to match it while using 100% stocks in its Upgrading "bucket," because the risk-reducing benefit of having half the portfolio in DAA is so great. The ability to move from Portfolio #3's 9.1% annual returns to Portfolio #5's 11.6% with virtually no change in risk is impressive. In fact, the risk reduction impact of DAA is so great, you could have invested only 40% of the Upgrading portfolio in stocks over the last 15 years (Portfolio #8) and still earned better returns than the all-stock, 100% Upgrading Portfolio (#1) we started the article with — and have done so with 50% less volatility! 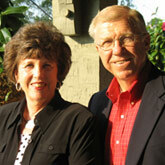 There are two ways an individual could immediately put this dynamic to work on their behalf. One approach is to keep the portfolio's overall risk level the same but go for much higher returns. This is essentially what we just described in comparing Portfolio #5 to Portfolio #3. Stated differently, if you were happy with the risk level of a 60% stock portion in your all-Upgrading portfolio (28% less volatile than the market), you could move to a 50-50 DAA/Upgrading combination with the Upgrading bucket invested 100% in stocks, and earn significantly higher returns with roughly the same volatility. However, this isn't the way we would suggest most readers approach it. Instead, we would encourage the majority of SMI readers to keep investing their Upgrading bucket using the same stock/bond mix as before, but with only half their money. With the other half, allow the risk-reducing properties of DAA to lower their overall portfolio volatility (while also producing higher overall returns). In that case, instead of a 60%/40% Upgrader switching from Portfolio #3 to #5 and keeping volatility roughly the same, we'd recommend they stick with that same mix but add DAA, in which case they would be in Portfolio #7. Here's why. DAA obviously has a dampening effect on volatility through its dynamic asset allocation process. But Chart 1 showed clearly that conventional asset allocation is also effective at reducing risk in its own way. Rather than substituting DAA's allocation benefit for Upgrading's, we suggest combining them and deriving benefit from both. The choice is up to you, but in the above example, a move from Portfolio #3 to Portfolio #7 would likely produce higher returns (11.0% vs. 9.1% during the 15-year test period) while reducing volatility (43% less than the market). Lower volatility is valuable in its own right, as it keeps investors from abandoning their plans under emotional duress. It's probably worth pausing for a moment to reinforce how dramatic the roughly 2% difference in annual returns between these sets of portfolios is. A starting investment of $100,000 in 1999 would have grown to $369,000 by the end of 2013 at the 9.1% rate of Portfolio #3. That same investment would have grown to $478,000 if it earned the 11.0% annualized return of Portfolio #7 — while experiencing less volatility. That extra 2% per year is worth a lot! Sector Rotation (SR) is SMI's highest-risk, highest-return strategy, and is designated as "advanced" primarily because of the substantially higher volatility it produces. That said, its track record has been extremely impressive since we rolled it out in 2003 (as well as in our backtesting, which extends back to 1990). SR is actually just a concentrated form of Upgrading, performed on narrowly-focused sector funds that invest in specific slices of the stock market. Whereas Upgrading focuses on broadly diversified mutual funds, Sector Rotation focuses on very narrow, non-diversified ones. Also, whereas Upgrading involves owning multiple funds at a time (as few as five or as many as 24), SR owns only one fund at a time. This narrow concentration increases risk, as there are no other holdings to buffer overall performance if the one sector we're invested in does poorly. Here's an example of both the pro and con of SR. At the end of March 2014, SMI replaced its SR recommendation — Fidelity Select Biotech — with a new fund. In the single month prior to its replacement, this biotech fund had lost 12%. That's a bad month, showing how quickly the fortunes of these sector funds can turn. But even after that 12% loss, this fund still registered a total gain of 115.5% for readers who bought it when first recommended in February 2012. It more than doubled our money in two years! That return, while exceptional even for this strategy, is the latest of many success stories over the years for SR. In fact, its annualized rate of return from 1990-present is more than 20%. But before you get all excited and put all your money in SR, it's important to recognize that we've also seen losses in SR as large as 38% in just three months. Most people are ill-prepared to deal with that type of volatility, so SMI has recommended that readers limit their allocation to this strategy to no more than 20% of their total stock allocation. Wouldn't it be great if we could get the awesome returns of SR without the associated increase in volatility? Perhaps you can see where we're headed — there is! 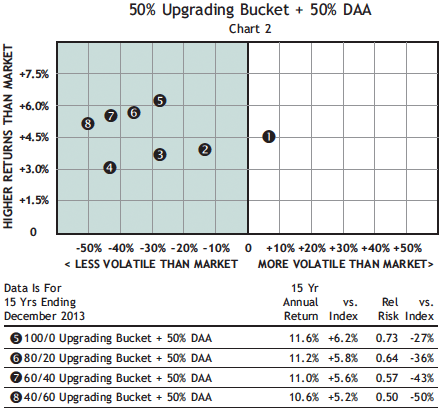 We just saw how dramatically DAA lowered volatility when added to an Upgrading portfolio. 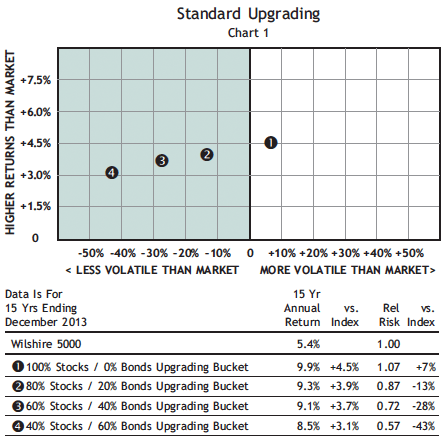 Now we're going to give back a little of that volatility improvement in order to boost returns via SR. Chart 3 shows what happens when we take 10% of the total portfolio away from regular Upgrading and devote it to SR. Why take it from Upgrading? You don't have to, but we think it makes the most sense because SR is really just another more intense form of Upgrading. By doing so, the portfolio now has three buckets: 40% of the portfolio is in the original Upgrading bucket (at the investor's regular stock/bond allocation), 50% of the portfolio is in the DAA bucket, and 10% of the portfolio is now in SR.
As can be seen, adding SR does push our new portfolios (Portfolios #9-#12) to the right in terms of volatility when compared to the 50-50 Upgrading/DAA portfolios we just discussed (Portfolios #5-#8). But, other than portfolio #12, these new portfolios are still considerably less volatile than they were at our starting point of pure Upgrading (Portfolios #1-#4). If we follow the sets of dots from the original Upgrading portfolios, we can see the progression from Portfolio #1 to #5 to #9, or Portfolios #2 to #6 to #10, and so on. Comparing the annual returns in Chart 3 to those in Chart 2, we can see that the addition of SR boosted the 15-yr annualized returns by an additional 1.7%-2.0%. Our "cost" for those extra returns is a modest 4%-9% increase in volatility. But with half of our portfolio remaining in DAA, our total portfolios are still 23%-41% less volatile than the market as a whole. In fact, our most aggressive Upgrading/DAA/SR portfolio (Portfolio #9) is only slightly more volatile than the 60%/40% traditional Upgrading portfolio from our initial group (Portfolio #3). As we noted at the outset, this article deals with advanced material. It requires a premium web membership to track the signals from DAA and SR, and requires more from an investor in terms of maintaining his or her portfolio. DAA and SR are updated on the last weekday of each month, which means tuning in an extra day each month (between our usual monthly releases). If that's more involvement than you want, there's no pressure to add these premium strategies to your Upgrading portfolio. But for everyone else, seriously? These charts demonstrate the potential impact of tuning in one extra day each month and making a handful of extra trades each year. Is that worth turning a 9.1% annualized return into 12.9%, as it did for an 60%/40% Upgrading portfolio over the past 15 years? Returning to our $100,000 investment made in 1999, instead of growing to $369,000 in all-Upgrading (Portfolio #3), it would have grown to $617,000 (Portfolio #11)! That's worth the small additional effort and cost involved with adding these advanced strategies. As we have often been reminded, "past performance is no guarantee of future results." The performance data shown in this article reflect the 15-year period from 1999-2013. Future periods will yield different results. However, the longer you apply these strategies, the greater likelihood you'll get similarly good results. Some may look at this data and consider making some of the changes but not others. Our counsel is this: it's fine to add DAA to your portfolio and omit SR. This takes you to the portfolios shown in Chart 2. But you need to be careful about adding SR if you aren't also adding DAA. DAA is what squelches the overall volatility of the portfolio — without it, you're adding an even more risky SR strategy onto Upgrading without anything to dampen that risk. One final note on implementation — don't worry about being overly precise with the percentages and amounts. The levels we chose for this article were relatively arbitrary: a 38% Upgrading, 55% DAA, 7% SR portfolio would likely perform similarly to our clean 40%/50%/10%. If you have multiple accounts and the amount of one of them happens to fit rather closely with one of the percentages you desire, go ahead and use it. The ease you'll gain by satisfying the needs of one of the strategies in that account will be worth the small deviation you might experience.